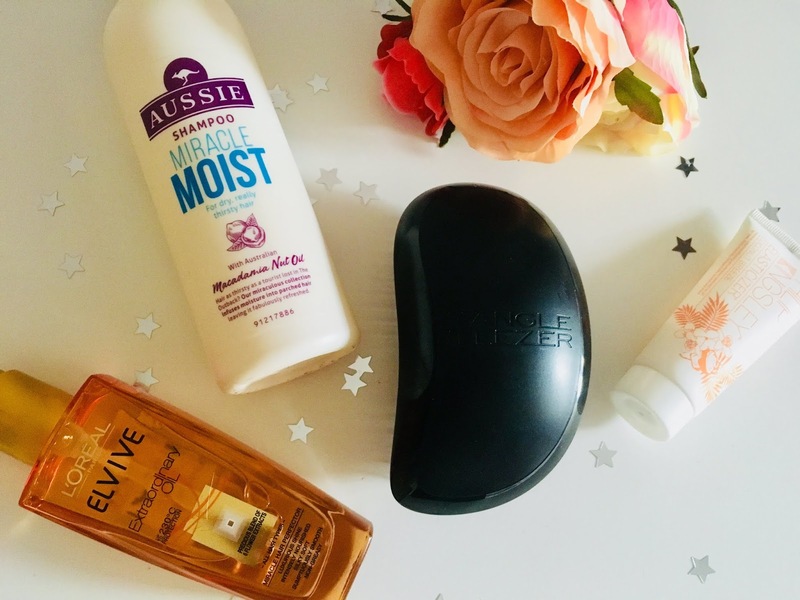 I'm not sure when the last time I wrote a haircare routine post was, if ever, but I felt the need to document what I'm doing lately to look after my locks! To describe my hair before we get into the post properly, I have A LOT of hair, however, it is quite thin so it appears very flat on the top of my head (which I hate). I've also had my hair balayaged several times over the last four years, which has begun to take it's toll, and has left my hair looking and feeling damaged and generally sorry for itself. At the beginning of this year I took the decision to stop colouring my hair, and get to work on getting rid of the colour and getting my hair back to full health, in this post, I'm going to take you through all the products and the things I've been doing to finally look after my hair properly! First things first, I've been ensuring that I have regular trims. I had a lot of damage in my hair, i.e. split ends and they needed to go straight away! My hair was always smelling burnt, even when I hadn't used any heat on it, and that wasn't a good thing! After I got rid of the dead hair, I felt so much lighter, and it was so nice to get rid of that burnt smell. I've been continuing throughout the year to make sure that my hair is trimmed every six weeks, and believe me, it made a massive difference to the health of my hair. It seems obvious, but sometimes it's very easy to put off a haircut or two! The next little tip I've been doing to keep my hair healthy, is to reduce the heat that I'm using on my hair. Throughout the Summer, I didn't even pick up my hairdryer! Now it's started to cool down a bit, I have been using my hairdryer a little more but I don't all the time. In terms of straightening or curling my hair, I only do that on occasion, but definitely not all the time! If I do use any heat on my hair, I'm sure to use heat protectant. 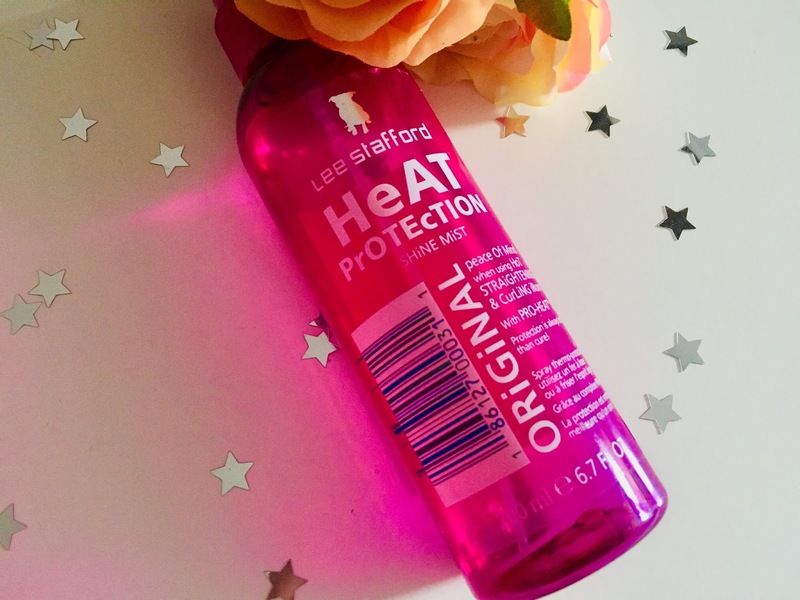 My favourite is the Lee Stafford Original Heat Protection. The last little tip I've been using is not to brush my hair while it's wet. If you brush your hair whilst it's still wet, you reduce the elasticity in the stands, therefore making your hair more weak and more prone to damage. I now tend to wait to brush my hair until it's mostly dry, and then I run my brush through it, starting at the ends to get rid of any knots before brushing the top of my hair. 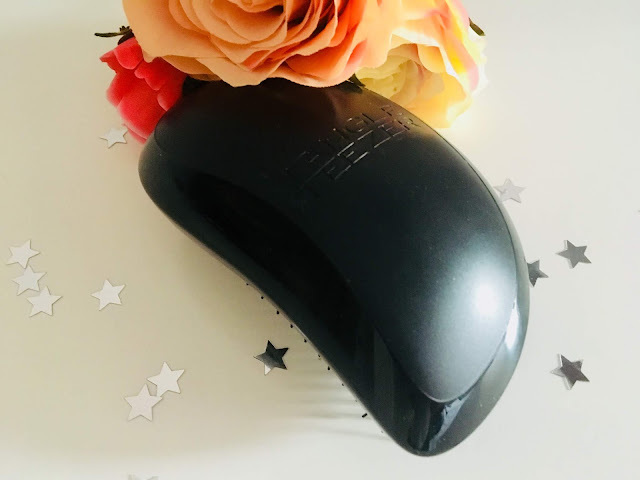 The brush I love to use is the Tangle Teezer. I started using this about four years ago, and haven't looked back since! Now, getting into the products which I use on a daily basis, I wash my hair twice a week and before each wash I like to use a hair mask. 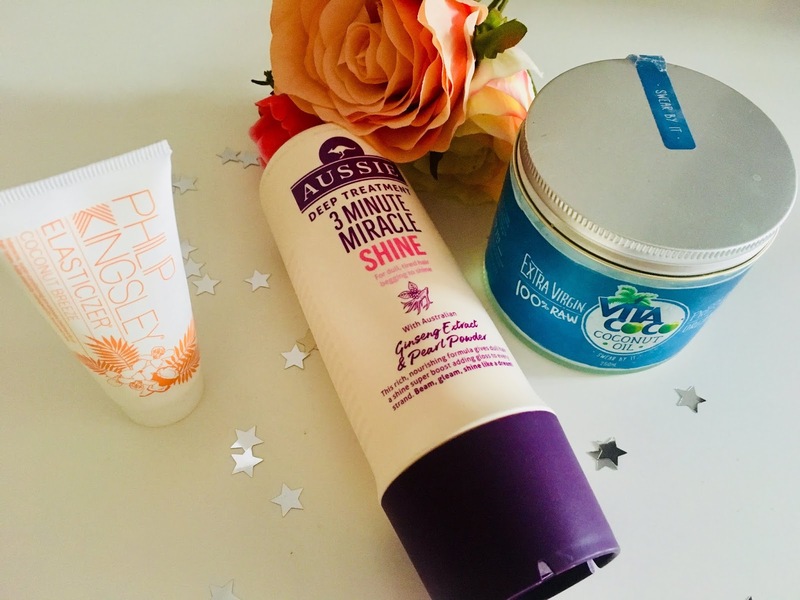 The first one I'm using is the Aussie 3 Minute Miracle Shine Mask, it's my dream to have really shiny hair, so I'm hoping this will do the trick! It does seem to be working so far! The second mask I'm using is the Philip Kingsley Elasticizer in Coconut Breeze, I received this in the M&S Summer Beauty Box and I love it! This product will help my hair to get stronger and have lots more elasticity in it. I also like to occasionally use Coconut Oil as a hair mask. I get a tablespoon of the Vita Coco Coconut Oil, warm it up in a cup in the microwave, and then rub it through my hair from the roots to my ends. I then leave it on for a few hours before washing my hair. 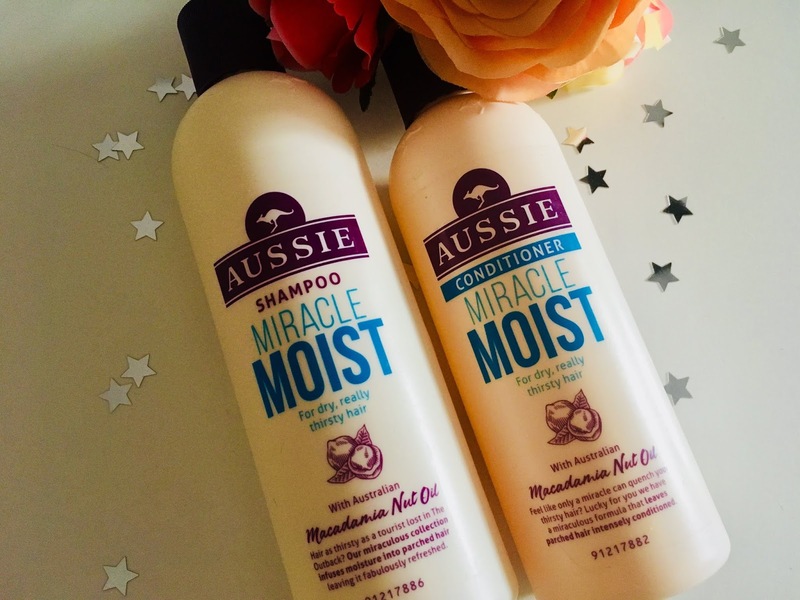 I've been using the Shampoo and Conditioner from the Aussie Miracle Moist range. I've used this shampoo and conditioner so often over the years, and always come back to it because I just enjoy using it so much! I'm a big fan of Aussie products, I love the scent of them! I've felt like my hair has been very dry after colouring it, so the Miracle Moist products have really helped to inject more moisture back into my hair, it's made a huge difference so far! 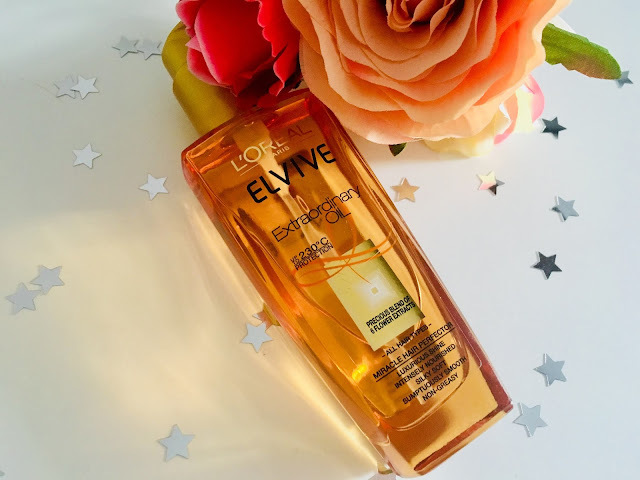 After I've washed my hair and I've towel dried it, I like to use the L'Oreal Elvive Extraordinary Oil. I just use two pumps, and it makes my hair smell incredible, feel soft, and look so shiny! I will definitely be re-purchasing this when I finally run out! That's pretty much it for my haircare routine! Let me know what products you love to use and help keep your hair looking and feeling healthy?